I once heard Tyler Krasowski say: ‘To be a great printmaker, you first have to know how to draw. Then you have to learn how to carve. Then you have to know how to print it’. Krasowski’s work lies somewhere between the notebook sketches and a daydream. Whether it be an eyeball taking a boat ride he did for a Pearl Jam design, or a meat-grinding shark being bombed by fighter planes, he is going to take you on a hallucinogenic ride through the clouds. Just make sure you watch out for those giant flying snakes. -Travis Lawrence in New Art. I hail from the Greater Chicago land area, and later received a BFA degree in Drawing at The University of Montana, MIssoula in 2009. I currently reside in Chicago. Relief Printmaking has become my balance and focus along with skateboarding and drumming. I owe my cutting chops to traditional master guild engravers of Bruegel the Elder, and the relief work of Durer. Much of my inspiration comes from watching cloud traffic. 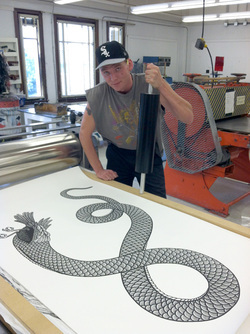 Tyler also worked with Drive By Press, where he travelled the country spreading the ink and was a assitant to Chicago based artist Tony Fitzpatrick. Tyler currently lives and works in Chicago. Tyler came back in 2014 and did a second project with MATRIX Press. Printing his large "Fast Food" and small "Car Crash" relief blocks. I would also like to thank the great print assistants Jason Clark, Beth Huhtala, David Tarullo, Eva Stone, Michael Workman, Max Mahn and Stephanie Reiman that worked on this project. - James Bailey, Professor & Director of MATRIX Press. While a visiting artist in September of 2012, Tyler working with Professor James Bailey and students pulled four editions of prints. Special thanks to student assistant Katie Machain.